The International Symposium aims to review the current status of obesity and diabetes treatment including drug therapy, novel therapeutic approaches as well as bariatric and metabolic surgery and to discuss how best to address the challenges in the future. The meeting is organised by Gianluca Bonanomi, Carel le Roux and Bobby Prasad. Obesity and its consequences are set to become one of the most important health care issues of the next few decades. Neither public health policy nor the available medical treatments have been able to consistently address the obesity epidemic, which continues to affect patients' health, quality of life and the wider impact on society. We believe that the challenge needs to be addressed through a multidisciplinary approach involving and promoting collaboration across different specialities including physicians, surgeons, policy makers, commissioners and managers. London 2012: The Future of Obesity Treatment reviewed the current status of obesity treatment and discussed how best to address the challenges in the future. We were privileged to have the world's leading authorities to address this challenging topic and we made the meeting as interactive as possible with expert panel discussions and a final debate on the different treatment options. The meeting was open to general practitioners, surgeons, physicians, diabetologists, endocrinologists, gastroenterologists, endoscopists, commissioners and managers, all of whom face their own specific challenges in this evolving field. Our invitation was also extended to trainees and allied health care professionals involved in the specialist management of patients suffering from obesity. The event was fully booked and the feedback was excellent. 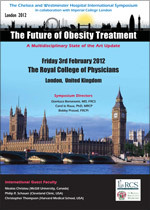 For those who attended, we hope you enjoyed this state of the art International Symposium on 3 February 2012 at the Royal College of Physicians in London.